Felon Leroy Jones joins other demontsrators outside court in Miami, Wednesday, April 9, 2003, where the 11th U.S. Circuit Court of Appeals is hearing arguments on whether the state is doing enough to help ex-felons restore their voting rights. Jones finished his sentence 10 years ago. Alabama does not have to notify tens of thousands of former felons that they recently regained the right to vote, a federal judge ruled. The judge also found that the state does not have to automatically restore voting rights to citizens who tried to register but were denied before the state’s law regarding felon disenfranchisement changed this year. In May, Gov. 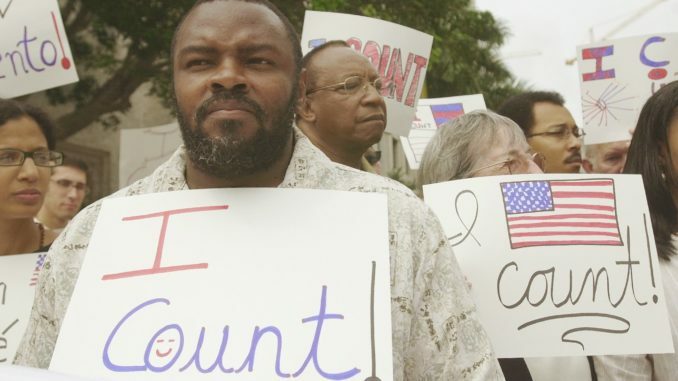 Kay Ivey (R) signed a bill defining “moral turpitude,” a century-old, white supremacist phrase in the state constitution that had been used to allow county registrars to arbitrarily block former felons convicted of certain crimes from voting. In practice, the law was used to disenfranchise more than 250,000 Alabamans, most of them black. After Ivey signed HB 282, Alabama Secretary of State John Merrill (R) said he would not dedicate resources to educating people about the change. In an interview with ThinkProgress, he said he has not heard from anyone who is being denied access to the polls and compared voting to a privilege, like receiving free ice cream. Arguing that Merrill’s logic is flawed, the Campaign Legal Center filed a request on behalf of ten former felons asking the state to educate and inform people affected by the new law that they can now vote. U.S. District Judge W. Keith Watkins, a George W. Bush appointee, denied the request, finding that the state only has a duty to inform county registrars about the change in the moral turpitude law. Former felons can proactively consult the law’s language to see if they are now permitted to vote, he said. Watkins’ ruling disregards the fact that many former felons likely do not closely follow the legislative process, and will not know that the law regarding their voting eligibility has changed. Those citizens who have tried to register but have been denied in the past will not know that they can now approach a registrar and regain their rights. “This motion/hearing was only about one slice of the case and was preliminary in nature,” she said. In May, Lang told ThinkProgress that HB 282 is a “step in the right direction,” but not a solution to Alabama’s problematic felon disenfranchisement law. The law still imposes what can be considered a poll tax because former felons have to pay fines and fees to restore their right to vote. “Wealth should not be a factor in deciding who can vote,” Lang said.